Marek Korber from Czech Republic traveled to the US for the first time with Eurolanche and wrote the following recap about the Eurolanche Invasion X. Five Eurolanche members from the Czech Republic, Slovakia and Finland took part in Eurolanche Invasion X. Most of the group met at the airport in Prague at 5:30 am. The last member of the group traveled alone from Helsinki. After our long trip, we finally arrived in Denver in the afternoon, rented our car and went to the hotel, where we checked in and spent some time in the pool to relax after our long journey. Later, we had dinner at the Czech restaurant Sobo 151, where we received a warm welcome and some souvenirs from the owner as well. 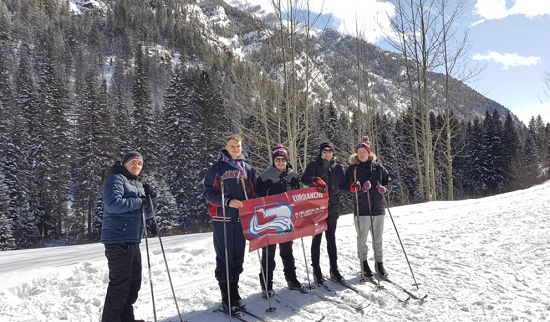 On the next day, we went on a trip to Aspen, which was one of the highlights of the Invasion X schedule for me personally, fulfilling all of my expectations. We ventured through beautiful scenery, the weather was fantastic and we enjoyed our little trip to the fullest. We ended the day by visiting a spa in Glenwood Hot Springs. Finally, the third day came. The day I saw my first Colorado Avalanche game at the Pepsi Center. A dream came true. We saw four home games in total in one week – against the Canucks, Flames, Wild and the Predators. The Avs’ record during that span – 3 wins and one overtime loss – was awesome. The entire arena fed off the team’s on-ice energy and especially the games against Minnesota and Nashville were electrifying. The crowd in the Pepsi Center especially enjoyed the 7-1 win against the Wild, as it became clear the Avs were going to take away the game midway through. Personally, I thought that the best game came against the Predators, despite the overtime loss. The Avs played a heck of a game against one of the best teams in the league and the Predators had to pull their goalie to tie the game and force OT. The summary was written by Marek Korber (second from the right in the photo). 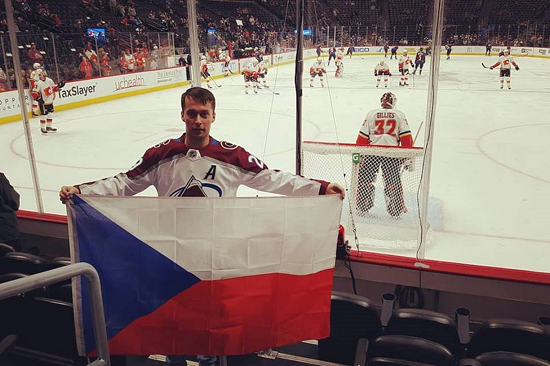 After nine days in Colorado, Invasion X continued with trip to Chicago and Columbus, where we went to two Avs road games. Both games couldn’t be more different. While Colorado was clearly the better team in Chicago, they were outplayed in Columbus. Despite their differences, both games ended in an overtime loss for Colorado. We praised the Avs’ play through regulation, but couldn’t help but criticize their awful performance in overtime, with the loss against Columbus being the third overtime loss in row. After our little road trip, we made our return to Denver to catch our last game against the then last-placed Coyotes. Those who expected a boring game were left surprised, as the game had almost everything – 7 goals, a couple of brawls and fights, and a great atmosphere. The Avs won 5-2, finishing the seven-game series we were in attendance for with 11 points and with 28 goals for and 17 goals against. The trip wasn’t just about hockey, though. We saw beautiful places in Colorado, Chicago, Indianapolis, Columbus, Cincinnati and also got to know the local culture. I really like to recall the times we spent in the Rocky Mountains, Garden of the Gods, Great Sand Dunes and the race track in Indianapolis. While in Denver, we also visited the local zoo, the police station, the mint and also went to a Denver Nuggets game. The Coloradoans were really kind and friendly to us. 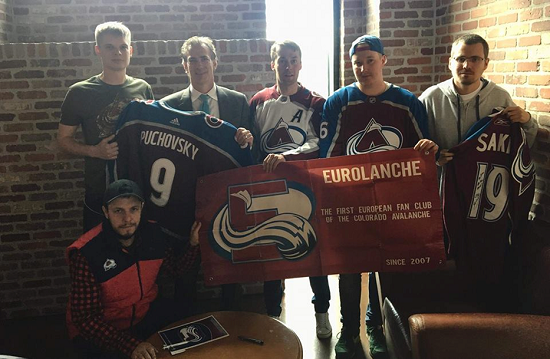 I was surprised that a lot of people recognized us as being Eurolanche members while going to the arena and thanked us for our support of the Avs. 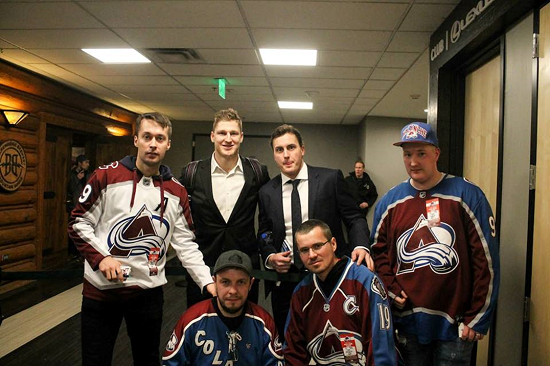 I also have to mention our meetings with Avalanche players, either with the current ones, including stars like MacKinnon, Landeskog, Barrie and Rantanen, or with former players like Sakic, Hejduk, Liles or Parker. Mikko Rantanen left the biggest impression. He’s really great with the fans and he was positive all the time. Our meeting with Joe Sakic was simply unforgettable. He was my idol since I was a kid and it was an honor to shake his hand. He was really kind to the entire group. Our meeting with former enforcer and Stanley Cup champion Scott Parker was also fun. He’s very open with fans. 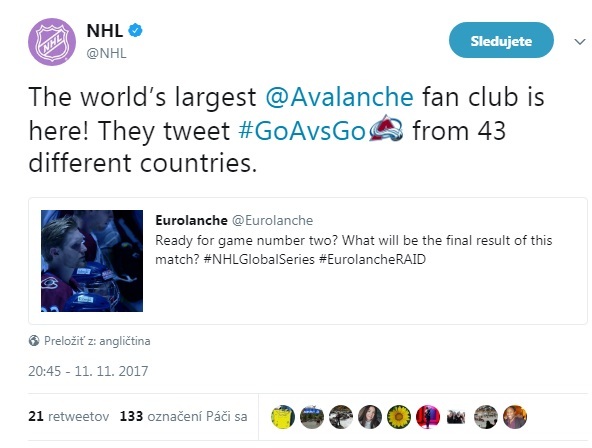 I’d recommend taking part in an Invasion to every Avalanche fan. Being in the stands of the Pepsi Center is a dream come true for an Avs fan. The atmosphere at the games was really electrifying. What’s more, the US is a country, which offers beautiful scenery and really interesting places that you can visit thanks to the schedule of the Eurolanche Invasion. After those beautiful 16 days overseas, we made our way back home. I bought my last souvenirs before boarding the plane that would take us on our long journey back to Europe. I arrived back home in the Czech Republic exhausted, but with great memories that I’ll never forget.